The final declaration of the recent NATO summit in Brussels says that the allies are committed to “working to address, as appropriate, existing dependencies on Russian-sourced legacy military equipment through national efforts and multinational cooperation”(paragraph 31). From now on they will “foster innovation to maintain our technological edge.” Actually, the very need to include such a clause into the text of the document speaks highly of “Made in Russia” weapons. The pledge to get rid of them is an attempt to please the US chomping at the bid to fill the void with American systems. At the same time, it hardly expresses the sincere desire of the nations that have Russian arms in the armed forces’ inventory to dispose of them. This is a very interesting issue worth having a closer look at. There is nothing new in this. It’s a time-worn topic. But whatever is said and promised, the allies continue to use Russian weapons. Some of them even make new purchases. It was assumed that former Warsaw Pact members, such as Poland, Bulgaria, Romania, Hungary, the Czech Republic and Slovakia, would get rid of them upon entering NATO (1999-2004). It turned out differently. The government of Poland is known for its anti-Russia stance but the Polish military has failed to replace Russian small arms, anti-tank and air defense systems, and Grad multiple rocket launcher systems, including the RM-70, the Czech version of Grad. Its aviation continues to use MiG-29 fighters, Su-22M4 attack planes, Mi-8 and Mi-24 helicopters. Warsaw has decided to shift an armored division in the east. The force will use modernized Soviet-made T-72 tanks. Hungary is the only former Warsaw Pact member to replace Russian (Soviet) combat planes. Germany withdrew from service its MiG-29s only in 2003 transferring 22 of the remaining 23 to Poland. Formally, they were sold for a symbolic price. T-72 tanks are a big success to be still used by Bulgaria, Hungary, Romania, Slovenia, and the Czech Republic. Germany continues to keep them in storage. Many hundreds of Soviet era armored vehicles are used or stored by former Warsaw Pact member-states. In the 1990s, Greece, which never belonged to the defunct Pact, purchased from Russia S-300 and Tor-M1 air defense systems along with air cushion craft and anti-tank missiles. The Russia-Greece military cooperation treaty was signed in mid-1990s to be still effective. The Army uses 500 Russian BMP-1 infantry fighting vehicles bought from Ger­many. Turkey’s military has in service BTR-80 armored personnel carriers (APCs), Mi-17 transport helicopters, anti-tank missiles and small arms. 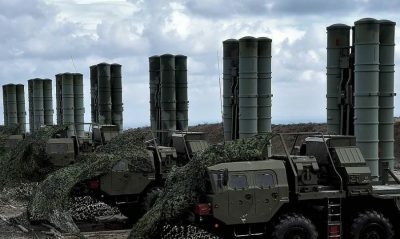 Ankara has signed a contract to purchase Russian cutting edge S-400 air defense systems and has so far resisted US vigorous pressure to cancel the deal. Removing Russia weapons is a serious problem for the Balkan NATO members. Montenegro, which joined NATO last year, maintains huge stockpiles of Russian weapons stored. Some systems, such as the Strela-2 man-portable air-defense system (MANPAD), are still used by its tiny 1,950-strong military. Slovenia and Croatia also use Russian weapons. The main problem is maintenance. Ukraine has tried but failed to service Soviet-era weapons in the inventory of NATO states. It leaves only Russia fit for the job. Last year, Bulgaria signed a contract with it for performing complete overhaul and technical maintenance of its 15 MiG-29 aircraft for $49 mln. It had tried to find somebody else but couldn’t. Interoperability is another problem and it will get worse. Sooner or later, obsolete Russian weapons will be removed but Turkey’s example shows there is a strong desire to purchase new ones and promote defense cooperation with Moscow. Greece would also like to do it but at present its economy is in dire straits. There are always ways to get around the rules. Some NATO countries, such as Poland and the Czech Republic, manage to find loopholes. They modernize Russia weapons giving them new names. This will enable them to say they comply with the rules while continuing to use them. Poland believes that buying a license from Russia to produce the Mig-29 makes it a Polish, not Russian, plane. The same applies to the Igla MANPAD renamed Grom-M to be later improved into what became known as the Piorun, with a new seeker and rocket motor. The Grom and Piorun missiles are integrated into the Poprad weapons station. It is exported as a Polish weapon. 23 mm ZU 23-2 GRAU 2А13 and 23-4 Shilka self-propelled anti-aircraft artillery guns have been upgraded with electric drives, fire-control systems (FCS), and detection systems and MANPADS to become Polish 23-2TG and 23-4МР Biała systems. The list can go on. The PT-01 Twardy tank is a modernized variant of T-72 tank built in Poland under license. No Russia-sold license is valid more than 5 years. A license cannot be re-exported. This rule is breached on and off. Russian weapons are reliable, simple in operation and maintenance, and boast comparatively low prices. Military cooperation with Russia could provide NATO countries with cheaper and more effective weapons than they are offered by the US and European defense companies. Operating Russian (Soviet) equipment presupposes keeping a relationship with Russia’s defense industry to perform maintenance and procure spare parts. Moscow is demonstrating higher efficiency of defense programs but the Russian bogey is used to justify unfair trade practices and thus benefit US and large European arms. Many countries will need favorable terms to buy American systems, like Poland in the case of the Patriot PAC-3 MSE deal. The US will practice defense lending schemes to make them tied to America forever. Ankara has signed a contract to purchase the S-400 despite the fact that any military cooperation is hindered by anti-Russia sanctions. New American punitive measures against Russia have entered into law to expose other countries to penalties for doing business with its defense industry and urging them to divest off of Russian weapons. Turkey refuses such an approach. It means the declaration says one thing but practice is different. Ankara does it because it says it wants the best. It may be contagious. Others will want the best for their money. As one can see, the loopholes have already been found. Anyway, nothing can change the fact that Russia is the world leader in producing the best weapons and the temptation to cooperate with it may happen to be too strong to be stopped by political pressure. Alex Gorka is a defense and diplomatic analyst.